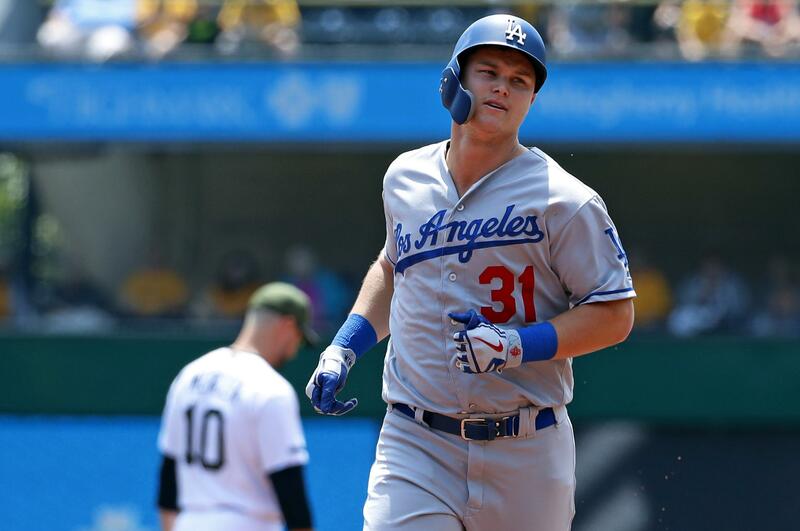 Thu., June 7, 2018, 10:35 p.m.
PITTSBURGH – Joc Pederson went deep twice, Cody Bellinger hit his third home run in as many games and the Los Angeles Dodgers used nine pitchers to hold off the Pittsburgh Pirates 8-7 on Thursday. Pederson led off the game with a solo blast off Jameson Taillon (3-5) and added a two-run shot in the eighth off Michael Feliz for his second multi-home run game in a week. Bellinger finished 3 for 4, including a shot just over the wall in left field in the sixth to give the Dodgers a three-run advantage, and a stream of relievers made it stand as Los Angeles won for the 15th time in its last 20 games to move back to .500 (31-31). Daniel Hudson made his first start since 2015, working only the first inning, after the Dodgers scratched rookie Dennis Santana from what would have been his first major league start. Santana experienced tightness in his right side during his pregame routine. Pedro Baez (3-3) picked up the win by getting six outs. Kenley Jansen worked around a pinch-hit homer by Francisco Cervelli in the ninth for his 15th save. Reds 7, Rockies 5 (13): At Cincinnati, Jesse Winker hit a two-run homer in the 13th, completing the Reds’ late rally that averted a sweep by the Colorado Rockies. One out away from getting their second series sweep at Great American Ball Park, the Rockies blew the lead in the ninth and wound up losing for the fifth time in seven games. They’ve blown leads in all of the five losses. Left-hander Chris Rusin (0-2) hit Joey Votto with a pitch to open the 13th. Winker connected on his first game-ending homer, finishing the longest game for both teams this season. Cubs 4, Phillies 3: At Chicago, Anthony Rizzo hit a solo homer and added a second RBI with a sacrifice fly to lead the Cubs past the Philadelphia Phillies. The Cubs won for the fifth time in six games to close to a half-game behind idle first-place Milwaukee in the NL Central. Tommy LaStella and Kris Bryant had RBI singles in Chicago’s three-run fifth inning. Rizzo’s sac fly to left capped the rally after a video review determined Phillies catcher Andrew Knapp had illegally blocked the plate with his left leg as Albert Almora tried to score from third. Almora beat Dylan Cozen’s strong throw from left field, but was unable to touch the plate with Knapp in the way. Almora initially was called out before the play was overruled. Brian Duensing (2-0), the first of five Cubs relievers, got the win despite allowing two runs over one inning. Phillies starter Nick Pivetta (4-5) lost his third straight, yielding four runs on six hits in five innings. Brandon Morrow pitched the ninth for his 15th save. Twins 7, White Sox 2: At Minneapolis, Jose Berrios pitched a six-hitter for his second complete game this season, and the Minnesota Twins hit three home runs against James Shields in a victory over the Chicago White Sox. Berrios (7-5) retired his first 14 batters before Omar Narvarez’s double. By that time, the 23-year-old right-hander already had a 7-0 lead. He struck out 10 and walked none to win for the fourth time in five starts. Eduardo Escobar hit a two-run homer after a double by Eddie Rosario in the first against Shields (1-7), who has not won in 12 starts since opening day. Ehire Adrianza added a solo shot in the second inning. Then right after Brian Dozier’s two-out RBI single in the fourth through a shift-created hole at second base, Rosario turned on an 86 mph cut fastball on the inside corner from Shields for a three-run drive just inside the right-field foul pole. Cardinals 4, Marlins 1: At St. Louis, Miles Mikolas rebounded from his first loss of the season to pitch three-hit ball over seven innings and lead the Cardinals over the Miami Marlins. Mikolas (7-1) allowed an unearned run, struck out five and walked one, lowering his ERA to 2.27 as the Cardinals salvaged the series finale after a pair of losses. Mikolas, coming off a 4-0 loss to Pittsburgh, has pitched at least six innings in 10 of 12 starts this season. Jordan Hicks pitched around a walk and a hit in the eighth, topping 100 mph on nine of 18 pitches, and Bud Norris finished the four-hitter with a perfect ninth for his 12th save in 13 chances. Jose Martinez homered for St. Louis. Trevor Richards (0-3), who was born in Aviston, Illinois, 50 miles from St. Louis, gave up three runs and seven hits in five-plus innings. Blue Jays 5, Orioles 4 (10): At Toronto, Aledmys Diaz hit a game-winning single in the 10th and the Blue Jays rallied from a three-run deficit in the ninth to beat the Baltimore Orioles. Danny Barnes (2-1) pitched one inning for the win, which looked unlikely when Orioles closer Brad Brach entered with a 4-1 lead in the ninth. Brach had a streak of 10 consecutive scoreless outings, but couldn’t extend his run. Austin Wynns hit his first career home run, and Danny Valencia and Mark Trumbo hit back-to-back home runs for Baltimore. Toronto’s Curtis Granderson hit his 46th career leadoff homer. Tigers 7, Red Sox 2: At Boston, Leonys Martin had a two-run homer to cap a five-run first inning and the Detroit Tigers beat the Red Sox. Left-hander Matthew Boyd (4-4) was solid in his third career start against Boston, allowing just four hits and two runs while striking out six over 6 1/3 innings. He gave up a solo home run to Andrew Benintendi and had three wild pitches. Detroit’s early onslaught spoiled the major-league debut of 24-year-old left-hander Jalen Beeks (0-1), who ended his first big league inning by giving up five runs and four hits, including the two-run shot by Martin to put Detroit in front. That is the most earned runs given up by a Red Sox starter in his first career inning pitched, according to Elias Sports Bureau. Mariners 5, Rays 4: At St. Petersburg, Fla., Mike Leake pitched into the ninth inning, Mitch Haniger homered and drove in three, and the AL West-leading Seattle Mariners beat the Tampa Bay Rays. Leake (6-3) was lifted with a 5-1 lead after allowing his eighth hit, a leadoff double in the ninth to Wilson Ramos. Johnny Field hit a three-run double off Alex Colome before the former Rays’ closer got a game-ending grounder from Daniel Robertson. The Mariners won for the 10th time in 13 games. Robertson and Denard Span homered for the Rays, who have scored 16 runs during a seven-game losing streak. The slide includes a three-game sweep last weekend in Seattle. Austin Pruitt (1-3) took the loss. Astros 5, Rangers 2: At Arlington, Texas, Evan Gattis hit a two-run homer and an RBI single, and Gerrit Cole allowed one run over six solid innings as the Houston Astros topped the Texas Rangers. Cole Hamels (3-6) didn’t allow a hit until Bregman’s one-out double in the fourth. Altuve singled home Bregman to tie it at 1 and scored on Gattis’ two-out homer. Bregman chased Hamels with his homer in the eighth. Hamels gave up five runs and seven hits, struck out five and walked two in 7 1/3 innings, his longest start of the season. Athletics 4, Royals 1: At Oakland, Calif., Matt Chapman doubled in the go-ahead run in the sixth inning to make a winner of Paul Blackburn in his first start of the season for the Athletics. Matt Olson hit his 13th homer, Stephen Piscotty singled three times and Marcus Semien added two hits and an RBI to help the A’s to their third win in four games against the Royals over the past seven days. Blackburn (1-0) was reinstated from the disabled list before the game after missing the first two months with a strained right forearm. The right-hander yielded three hits, including Alcides Escobar’s home run in the third and induced 11 groundouts over six innings. Kansas City’s Jason Hammel (2-6) matched Blackburn until Oakland broke through for three runs in the sixth. Published: June 7, 2018, 10:35 p.m.